For added convenience, we are pleased to offer as an additional rental option our professional uniformed restroom attendant with your CELEBRATION TOILET portapottie rental. CALLAHEAD's additional rental options for all of our portable restrooms were selected to provide your guests the same comforts as if they were using an indoor restroom of a great catering hall. CALLAHEAD portable restroom rentals and additional accessory rental options are unmatched in the portable sanitation industry. Professional Uniformed Portable Restroom Attendants are available to maintain cleanliness of this luxury portable toilet rental during your special event so you don't have to. 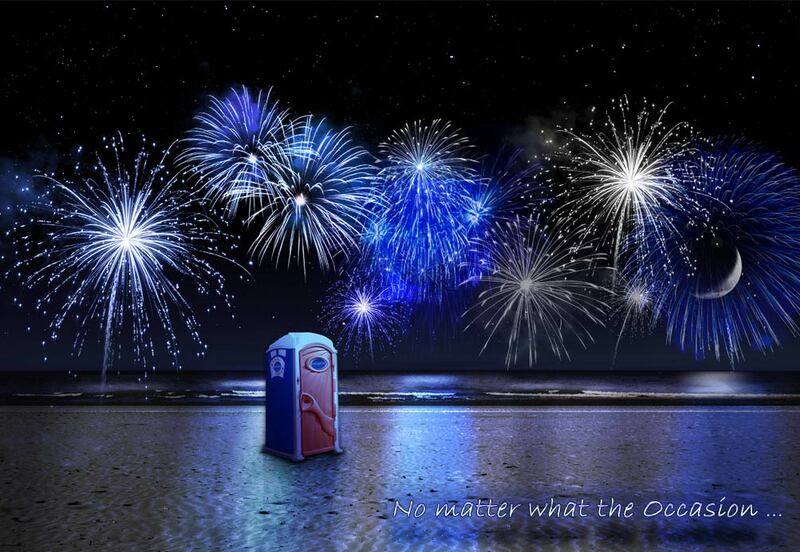 Our trained professional portable restroom attendant will clean your porta potty rental/s after each user to ensure every guest is guaranteed a clean visit to the CELEBRATION TOILET portable restroom. Uniformed restroom attendants are recommended: When renting a large number of porta potties; renting portable restroom trailers; if you have a large number of guests and a small number of portable toilets; if your special event is either dressy, formal or black tie attire such as a wedding, bridal shower, baby shower, christening or bar and bat mitzvahs; when men, women and children are using the same portable toilet. 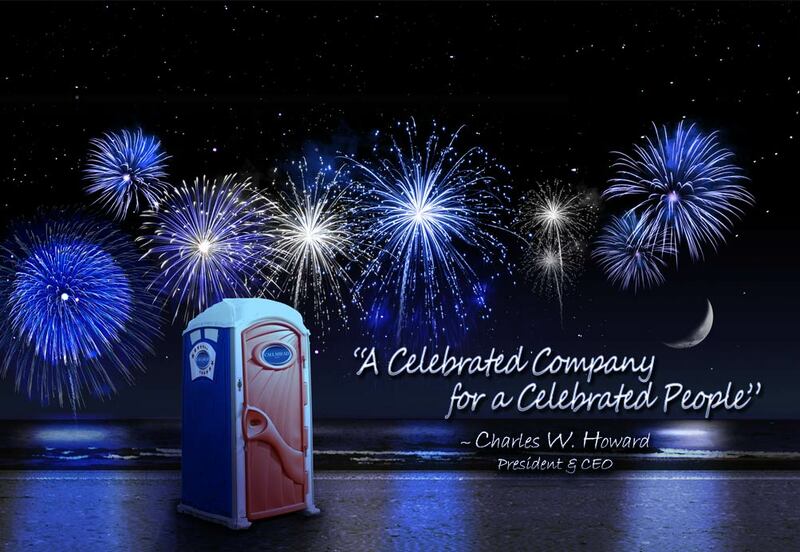 The CELEBRATION TOILET is a VIP special event portable toilet for rent that depicts American pride for any social gathering. This is a full service outdoor porta potty available exclusively through CALLAHEAD. 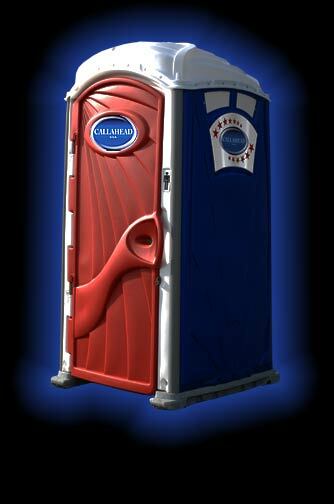 Designed with the American flag's colors of red, white and blue, will bring a patriotic touch to sporting events, barbeques, house parties, graduation parties, fund raisers, weddings, corporate gatherings, community events or just about any special event in need of outdoor restroom facilities. 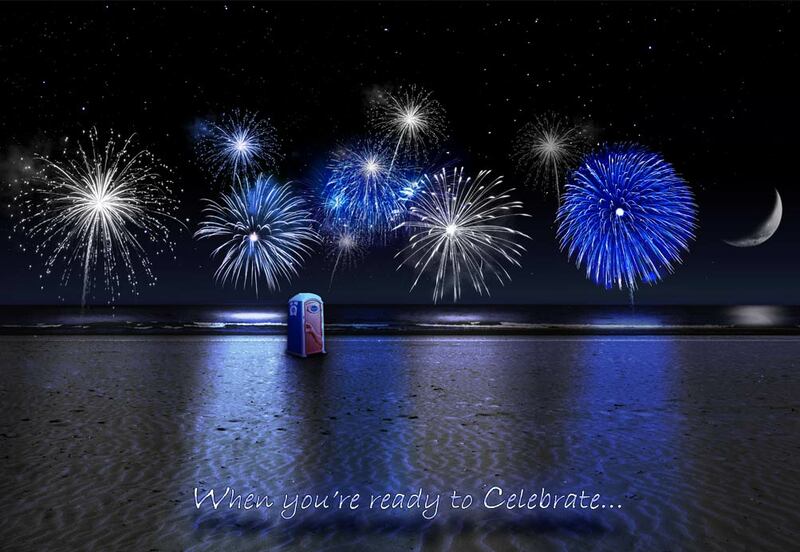 Our CELEBRATION TOILET is a premium portable restroom rental that has all of the amenities of an indoor restroom and then some. 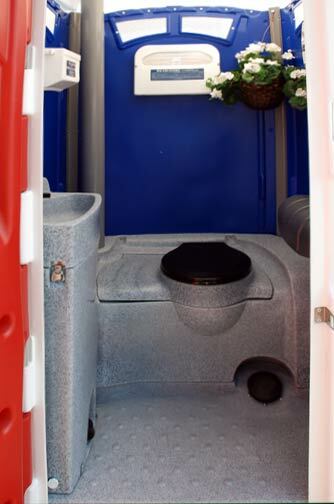 The porta pottie will add to your events décor and has the "CALLAHEAD USA" signage, representing you rented the best portable restroom facilities for your guests. This portable toilet rental has every accessory of a high end catering hall bathroom facility, while still being completely mobile and self-contained with no outside water source needed. 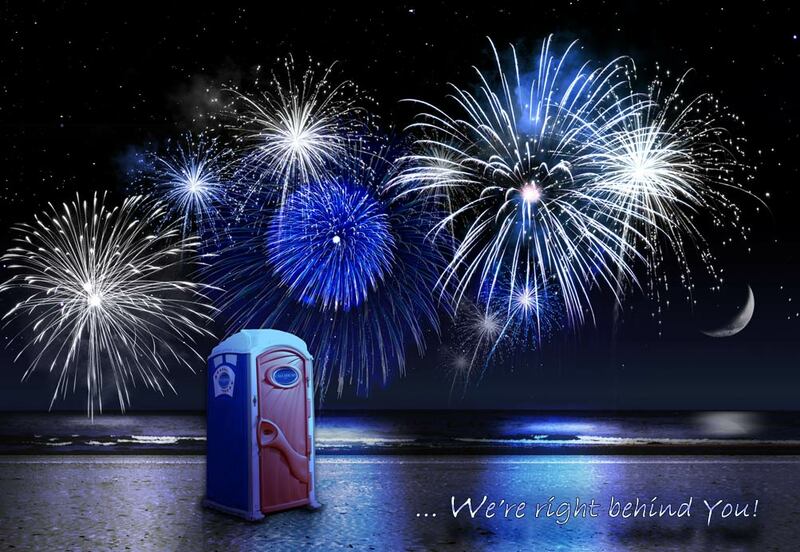 Our CELEBRATION TOILET is a durable porta potty that will have the most skeptical users of portable toilets comfortable. The port a potty's sink supplies hands free washing. A foot operated pump supplies a stream of fresh water for sanitary hand washing ability. The hands free flushing toilet will also be appreciated by guests for hygienic protection. A closed cavity tank keeps the waste out of site and eliminates odors inside the portable restroom. Premium CALLAHEAD accessories come standard with the CELEBRATION TOILET rental. Headliner toilet seat covers are installed to ensure every user has a clean, dry and sanitary toilet seat. Our Headmist time released air freshener will remove odors caused by previous users so every person is ensured a pleasant trip to the port a potty. Also included with its rental, is our filled antibacterial soap dispenser, fully stocked paper towel dispenser and an elegant floral arrangement. The CELEBRATION TOILET port a potty has an occupancy sign on the exterior door with an interior lock to provide every guest complete privacy. The spacious interior has a coat and hat hook, large mirror, covered dual roll toilet paper dispenser and convenience shelves. This outstanding special event portapotty has superior ventilation with 6 vents that will circulate the air and eliminate odor. A translucent roof will provide excellent natural light during the day and has an interior solar powered light for evening use. The CELEBRATION TOILET is constructed of high density polyethylene with dual paneled side walls for extra durability. This American style portable toilet rental will be a memorable addition to tailgate parties, parades, school functions, Fourth of July barbeques and firework displays, beach parties, birthday parties, Memorial Day gatherings and concert events. The CELEBRATION TOILET will definitely have guests talking and is sure to please. Every special event deserves every detail to have a special touch. We understand it is the host's responsibility and desire to provide clean and sanitary restroom facilities for their guests. Only CALLAHEAD portapotties guarantees to rent only clean, like new portable toilets every time. Same day delivery to New York City's five boroughs of the Bronx, Brooklyn, Staten Island, Queens and Manhattan and Nassau and Suffolk Counties on Long Island as well as all of Westchester County. CALLAHEAD has been servicing New York's special events with the best, cleanest and most innovative portable toilet rentals since 1977. Providing service that you can trust from the #1 portable sanitation company in New York. Make sure your portable restrooms arrive at your special event as you ordered it with our uniformed professional white glove service that you can only get from renting a CALLAHEAD. The following is a list of special events where the CELEBRATION TOILET porta pottie is most commonly rented. However, this premium portable toilet is an ideal rental for just about any outdoor special event, indoor special event with limited restroom facilities or public location where portable restroom facilities are needed.